As water is becoming a scarce resource, it looks like the recycling of water for reuse is the way to go. The truth of the matter is that water scarcity has not yet become topical because like air, it is a resource we take for granted until we are faced with its shortage. It is no wonder that the adage; 'Water is Life,' was coined to show its importance. This is the reason why we must guard its supply and use with seriousness. It is also due to its importance to the existence of humanity that it features prominently in the Sustainable Development Goals (SDGs), which include the universal set of goals, targets, and indicators that the United Nations (UN) member states will be expected to use to frame their agenda and political policies over the next 15 years. SDG's Goal Six talks about ensuring clean water and sanitation. This means Ghana, a member of the UN, needs to improve water quality by reducing pollution, minimising the release of hazardous chemicals and materials, and halving the proportion of untreated wastewater and substantially increasing recycling and safe reuse by 2025. Statistics from a Non-Governmental Organisation, WaterAid, show that globally, an estimated 844 million people face a daily struggle to access enough potable water. Majority of people, especially those in the rural areas, have no choice but to use unclean water to wash, cook, clean, and drink same resulting in them falling sick, which affect their education and livelihoods. Sadly, of the 844 million, more than three million of these people are estimated to be Ghanaians who lack access to improved drinking water sources, due to several factors. Dr Donald Senanu Agumenu, the Executive Director of Water for Rural Africa (WRA), said climate change effect, population growth and migration, settlement in hazard-prone lands, and uncontrolled discharge of wastewater among other things were some of the factors threatening water security. He said industrial wastewater could be recycled and reused with the political will, especially at the time that government was poised to pursuing the industrialisation agenda. Mr Stanley Martey, the Head of Public Relations and Communication of Ghana Water Company, agrees that one of the ways of ensuring good management of water is to make the effort to recycle wastewater, especially from the industries, to avert the looming water-stress predicted by experts by 2025. 'The benefit of this for us is in two folds: first the demand by industries will be less, and there will be a good pressure to serve more households to have access to potable water and this fulfils the mission of GWCL. 'Second, the stress of GWCL having to manage potable water supply during the dry season as a result of low water levels at the various intake points will reduce,' Mr Martey said. As the country continues to strategise on the way forward, NestlÃ© Ghana, in June 2016, invested CHF 1.5 million in a Water Recycle Plant in the company's factory in Tema for the purpose of reducing its water footprint. This means some of the treated wastewater can be reused instead of using fresh groundwater. 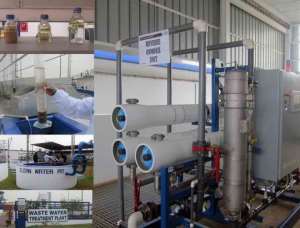 The Ultra Filtration-Reverse Osmosis system is helping to improve the quality of treated wastewater to enable the reuse of water by 30 per cent and lower the total water consumption by 10 per cent. Mrs Ama Amoah, the Corporate Communications and Public Affairs Manager of the Company, explained that NestlÃ© recognises water as a resource vital for human life and is committed to a responsible use of this resource. 'We invested in wastewater treatment facilities across all NestlÃ© factories to ensure water is managed sustainably and protected across our value chain,' she noted. Basically, the wastewater goes through two major processes namely; a classical biological process and a filtration process. The filtrations used for this purpose are Ultra-Filtration (UP) and Reverse Osmosis (RO). Mr Johnson Alao, the Factory Engineering Manager, NestlÃ© Ghana Tema Factory, explained that the wastewater is channelled to a balancing tank to mix the various processed wastewaters to attain equilibrium and it is then sent to the aeration tank where bacteria is bred to feed on it. The wastewater is then transferred to the clarifier for separation where the inorganic materials, including sand, fat, and other sediments, are separated from the water. He said the water is further purified and chlorinated through a latest high-level filtration system (UP and RO filtration), before it is pumped to the factory for non-core production activities like cooling towers makeup. 'To ensure that the final filtered water is good for living organisms, it is tested with mudfish as a live check to ensure that the water, which is being released, is not harmful to aquatic life. If it is acidic the fish will not survive. Further, the water is frequently tested in the Nestle in-house laboratory to ensure the quality is fit for use. 'We follow the strictest safety parameters by the Environmental Protection Agency (EPA) and we send a quarterly report to the officials, who periodically visit to take samples to check the water being discharged. 'One key advantage of this is that the treated water will not harm any organism when we discharge into the marine environment. We follow the strictest safety parameters by the World Health Organisation. We send a monthly report to the Tema Municipal Assembly and their officials periodically visit to take samples to check the water being discharged,' he added. Mrs Esi Nerquaye-Tetteh, the Deputy Director of Manufacturing Industries Department at EPA, confirmed that NestlÃ© complies with most of the effluent quality parameters for the food and beverage sector. 'We have about 20 effluent quality parameters that companies like NestlÃ© are required to comply with before discharging effluent into the external environment. The company complies with more than 80 percent of the parameters. This is satisfactory,' she said. NestlÃ© is committed to water stewardship and conservation because it regards water as a valuable resource. 'Treating the water allows us to reduce consumption of water and use water efficiently. It has resulted in a more efficient use of water by the Factory and hence contributed to the overall NestlÃ© water sustaining initiative on the environment. This investment reflects well our company's purpose of enhancing the quality of life and contributing to a healthier future,' the Corporate Communications and Public Affairs Manager of Nestle, Mrs Amoah, said. Dr Agumenu suggests that government introduced a legislation that would mandate all public institutions and production industries to recycle their wastewater and re-use it. 'Production companies should know that if they want to grow and sustain their businesses, they must recycle and reuse wastewater. Water is a critical commodity that supports industrial work,' he said. Similarly, Mr Ray Heslop, an Engineering Advisor at WaterAid, thinks the 'polluter pays' principle under which those who pollute are sanctioned and fined, must be applied by authorities to compel industries to recycle and re-use, adding that any polluter who refuses to recycle must be dealt with. Mrs Nerquaye-Tetteh explained that government, through the EPA, as a way of providing incentives to industries to recycle wastewater, has instituted a periodic training on cost-benefit analysis of wastewater recycling to encourage them to invest in water recycling technologies. 'At these trainings, we give them practical examples, share some best practices all over the world and do the mathematics to let them know that there is the urgent need to recycle wastewater,' she explained. Let's guard water jealously to ensure sustainability of the resource. The time to act is now.